Typically in the 20th century, education revolved around the notion of boundaries and separation, for instance boundaries between different disciplines and education being fortified. Due to the characteristics of Roosevelt Island being segregated from the main city of New York, our objective is to improve community engagement between the city and the island. Our strategy is to break these boundaries to attract and feed out education which will enhance the city to campus relationship. It is through the means of integration and blurrifying that education is able to be brought into the city life. The Vertical Green is a hybridization of a hostel, park and auditorium where the campus operates as a dual functioning building. we viewed our project through the lens of an auditorium due to our position of “boundary-less-ness” between the city and the campus and in the education system. The typical characteristic of the auditorium is the congregation of people from different disciplines, sharing their ideas. The park spaces located on the roofs of the hostel spaces operate as performing and viewing platforms. Through the idea of duality the location of particular hostel living spaces are situated under the stairs. This has created an interesting moment where program and circulation are united and integrated into one. This building aims to provide opportunities to access program in multiple routes and through the visual connections between programs and with the city. The circulations natural flow is explored through the multiple pathways, connections and routes between programs. Views between programs and the city were created as a result of the circulation and programmatic organization. The visual connections created allow the building to have a panoramic/360 degree view of Roosevelt Island, Queensborough Bridge and the city. Reciprocally, people from the streets are given the opportunity to view into the building. This skyscraper is elegant and porous in its form which allows it to have many internal and external connections. The construction of this built park and skyscraper involves complexity in its engineering. 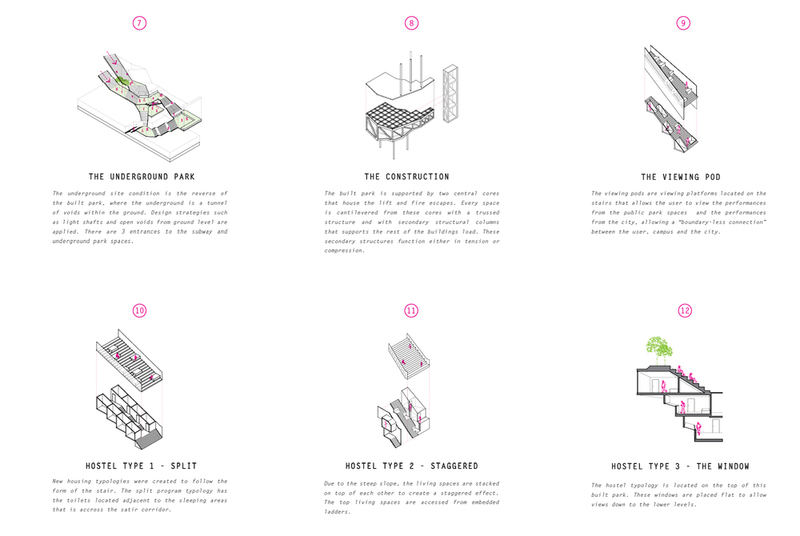 The built park is supported by 2 central cores that house the lift and fire escapes, every space is cantilevered from these cores with a trussed structure and secondary structural columns, which either work in tension or compression. This entire skyscraper is a cantilever.